Exosomes represent one of several species of extracellular vesicles. They are generated in a cell’s interior and secreted through the membrane into the extracellular space. They fulfill a critical role as communicators among cells, with targeting and message content depending on their surface receptors and payload. This makes them obvious candidates for an extensive range of diagnostic and therapeutic applications (1–3). In turn, it creates a need for industrial purification tools that can accommodate their unique stability and contaminant profiles. Exosome source materials such as plasma, serum, and cell culture harvests contain a number of more abundant vesicle types, including microvesicles and apoptosomes. Despite their distinct origins and biological roles, they share many surface chemistry features, the most basic feature being that they are all lipid-enveloped. Exosome size overlaps with microvesicles (70–150 nm with 50–2,000 nm), and both overlap with high–molecular-weight aggregates, lipidenveloped virus species, and lipid–lipoprotein associations. Apoptosomes are generally much larger at 500–5,000 nm, but their densities overlap with exosomes (1.10–1.21 g/L with 1.16–1.28 g/L) (4). The outer leaflets of apoptosomal lipid envelopes are enriched with phosphatidyl serine, but the same is true of exosomes generated by inflamed cells, such as those associated with many pathological conditions (5). And then there are the usual host-cell protein and DNA contaminants, which are far more abundant than all of the vesicles combined. Exosome lipid envelopes meanwhile make them vulnerable to multiple sources of stress. Extremes of pH alter the electrostatic and metal-affinity interactions that stabilize the envelopes. Surfactants and organic solvents can destabilize the lipid component. Excessive concentrations of sugars and salts can induce structural damage by osmotic shock. The envelopes’ structural weakness and large size make them vulnerable to shear stress. All of these features restrict the scope of applicable purification methods and conditions. 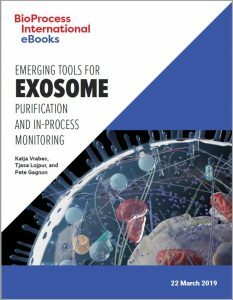 Exosomes also represent a challenge for process monitoring, which further complicates their purification. The sizes of the respective vesicle types all are above the resolving range of size exclusion methods. They absorb very little UV light. That makes them difficult to detect and discriminate chromatographically from more abundant and stronger UV-absorbing host proteins and DNA, especially in the form of residual chromatin. Insights from electrophoresis also are compromised. Exosomes and other vesicle types are compound lipid-membrane-bound assemblages containing their own nucleic acids and a variety of proteins. They produce multiple bands of different intensities over a wide range of molecular weights. That makes it difficult to distinguish electrophoresis fingerprints among vesicle types, especially against a backdrop of contaminating host-cell proteins. Some of those burdens can be overcome, but it takes time. Electrophoresis can be augmented by Western blotting for exosomespecific antigens, but that is laborious, increasing assay time to at least two days. ELISAs can be automated to increase throughput, but they still require close to two days. Dot-blotting lacks both the sensitivity and specificity of Western blots and ELISAs and still requires the best part of a day. Also, assembling a library of adequate quality antibodies is a project in itself. These additional requirements substantially increase the analytical burden, which unfortunately tends to discourage in-depth characterization of purification options. Just fill out the form to download the eBook now.